Luxury Bed and Breakfast Accommodation near Australia Zoo, Sunshine Coast Hinterland, Queensland. In 1999, Ken set off on a roaming adventure to search for a new lifestyle and a property for his dream business. 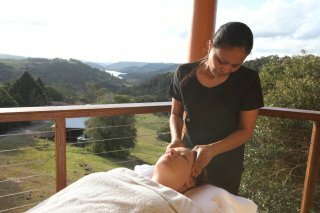 The seed for the Maleny Tropical Retreat was planted when it was recommended to detour through the Sunshine Coast Hinterland, where Ken discovered the lush and idyllic countryside of Maleny and Montville. The dream of building a holiday retreat took root on a walk through neglected farmland with superb views of Lake Baroon. A run-down farmhouse nestled in the edge of a lush tropical forest looked like cabin sheltered in a Balinese hillside. By 2001, Maleny Tropical Retreat opened its doors as a two-bedroom, Balinese-styled, 4 ½ star Bed and Breakfast, surrounded by beautiful tropical gardens. Over the years, the business and gardens grew — more rooms added to the restored farmhouse, as wells as four luxury Balinese Villas that now dot the hillside. As the Maleny Tropical Retreat flourished, Ken’s sisters Dawn and Daphne joined the business, and the family trio now work together to treat guests to relaxing and peaceful holidays. Customers and Trivago have recognised the warm and welcoming customer service and accommodation, and voted Maleny Tropical Retreat the Number 6 Top Hotel on the Sunshine Coast in 2015. The Trivago ranking is the aggregated rating compiled from over 250 online booking websites. Ken, Dawn, and Daphne are proud to welcome you to the Maleny Tropical Retreat, and invite you to come and relax in its tranquil surrounds. Book now for your relaxing retreat.